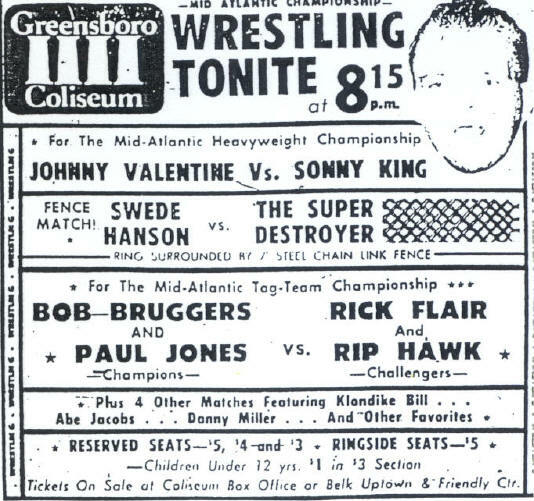 Who in that Greensboro Coliseum crowd could have known that when veteran Rip Hawk and his "nephew" Ric Flair won the Mid-Atlantic Tag Team title that it would be the first in a string of championships that would include regional titles as well as reigns as NWA, WCW, and WWF World champion, and NWA and WWE World Tag champions. 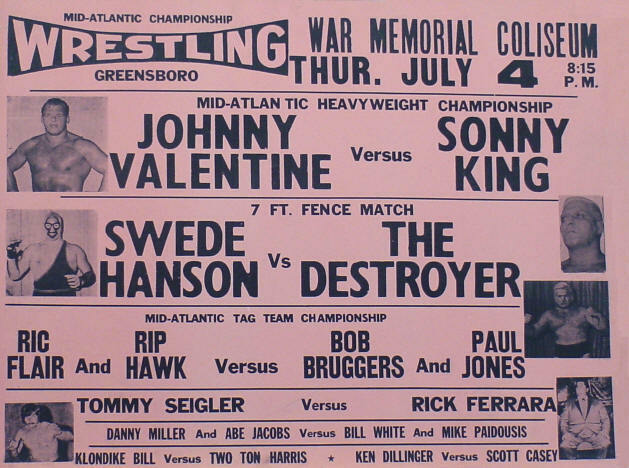 Flair was just getting started on that Fourth of July in 1974, and those on hand to see the fireworks that night knew they were seeing something special, even though no one would have guessed how significant history would judge that night. JULY 4, 1974 GREENSBORO, N.C.
Bill Janosik Photo of the Mid-Atlantic Tag Champs Wearing their belts.